Thanksgiving - the Super Bowl of all meals which makes it my favorite holiday. Thanksgiving is mainly an American holiday where it's tradition to watch football (most likely the Dallas Cowboys or Detroit Lions) and eat such dishes like mashed potatoes, gravy, cranberry sauce, yams, pumpkin pie, and of course the turkey. Many Americans have also adopted a new tradition for Thanksgiving - fried turkey. 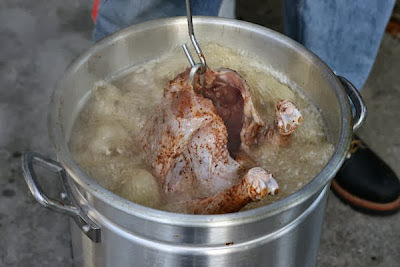 Because deep frying a turkey has quickly become a common practice in many American households, I thought I'd offer a few valuable tips from my experience in frying turkeys which might prove useful for anyone interested in a deep fried turkey for Thanksgiving. Frying a turkey is not like frying chicken. You don't have to dredge it in flour, egg, or breadcrumbs. What you would normally do is brine it in some water/salt solution at least overnight up to a few days. This will prevent the white meat from the breast from drying out. I like using a turkey weighing somewhere between 12 to 14 pounds. I prefer a smaller turkey because I still like preparing a traditional turkey in the oven (for those traditionalists) giving my family and guests the option of both turkeys instead of 1 large 20+ lb turkey. I fry the turkey for two and a half minutes per pound. 3 minutes per pound seemed to overcook the turkey and dry out the white meat while 2 minutes undercooked, so two and a half minutes worked well for me. There are various oils you can use to fry the turkey like corn or canola oil. I prefer to use peanut oil. Although peanut oil tends to be a bit more expensive than most other oils, it seems to last longer before going rancid, but more importantly, it has a high smoke point unlike, say, olive oil. For your information, peanut oil is commonly used in Chinese cooking. If no one in your family has any peanut allergies, then go with peanut oil. For extra safety, wear long sleeves, pants, and shoes to minimize getting burns from the hot oil. You could even use goggles as well if you're not completely comfortable. Always be safe and take the proper precautions. It's always best to be safe than sorry. I normally heat the oil to 365 degrees before dropping in the turkey. Just prior to lowering the turkey into the fryer, I like to pat dry the turkey with paper towels (after the turkey has already been removed from the brine, rinsed (so that it isn't too salty), and allowed to dry a bit of course) to minimize the amount of water going into the hot oil. In case you didn't know, water and hot oil do not mix and can cause small explosions. The water will turn into steam. The hot oil is hotter than steam and the steam expands violently causing these explosions. Lastly and most importantly, here's the one tip that I hope everyone follows. This tip is worth it's weight in gold. This tip can be explained with the help with the diagram below. It has to do with the amount of cooking oil you use. Do this step before you brine the turkey. You get your empty turkey fryer (step 1). Then, you put your turkey in it (step 2). You fill it up with water so that the water just covers the turkey entirely (step 3). 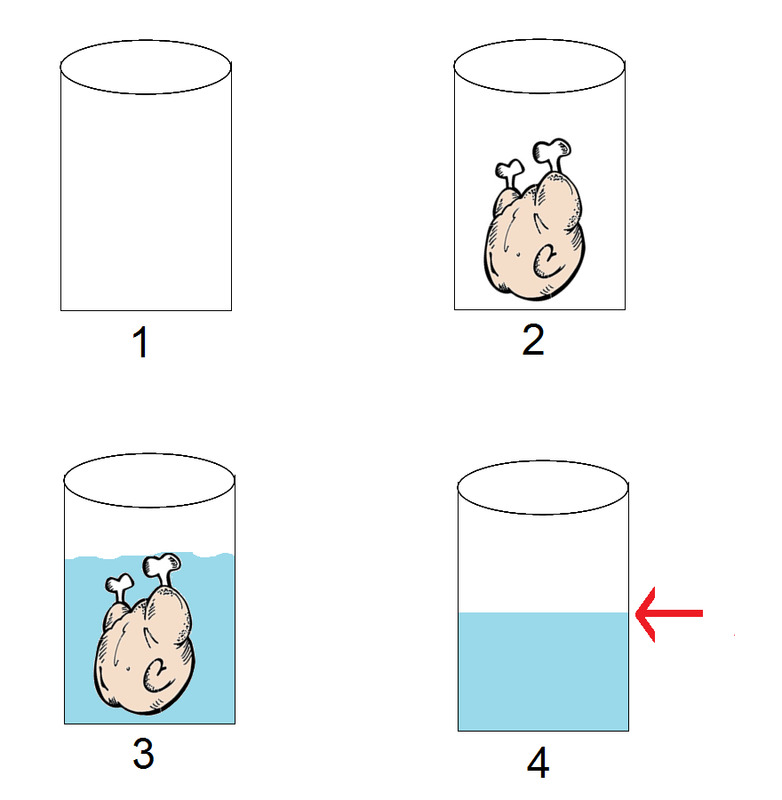 You take your turkey out and before dumping the water, note the water level (denoted with the red arrow) once the turkey has been removed (step 4). The water level at this point is where you will later fill up your pot with oil. Figuring our the appropriate amount of oil to use for deep frying a turkey for Thanksgiving. Why is this step so important? It's important because you don't want to put too much oil in your fryer. You only do you want to use just enough oil. You often hear in the news about people burning down their house because they wanted to fry a turkey for Thanksgiving. 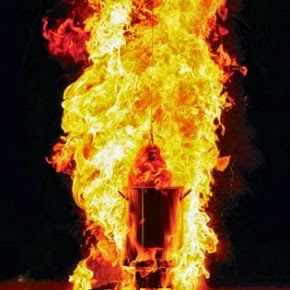 What sometimes happens is that they use too much oil such that when they lower the turkey into the hot oil, the oil overflows out of the fryer pot and down to the open flame of the burner causing a grease fire. At that point a burnt turkey is the least of your problems. Using too much oil - don't let this happen to you. I hope you find these tips helpful and I hope everyone has a safe and wonderful Thanksgiving! Happy Thanksgiving!